Cheese is a staple food in many kitchens. It is an ingredient in different dishes and cuisines and can be eaten plain as well. While there are different types of cheese available on the market, there are also different ways of preparing it. Two options are shredding cheese and grating it. What is the difference between the two? Let us find out in this article. Made of cheddar, Edam, and mozzarella cheese Made of parmesan or romano cheese. Shredded cheese looks like thin strips of cheese. Soft block cheese is usually shredded to have a consistent shape and size. Soft block cheese is placed in the freezer for at least twenty minutes to firm up. Then a grater is used to shred the cheese. Olive oil can be applied to the blade of the grater to prevent the cheese from clumping. Packed shredded cheese sold in grocery stores usually contains potato starch, powdered cellulose, and natamycin. 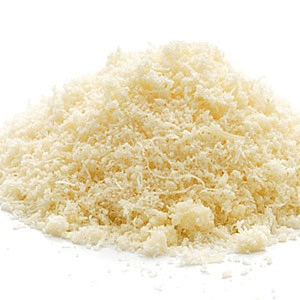 Potato starch is used as a thickener and prevents the shredded cheese from clumping. Natamycin is an anti-mold agent that prevents the shredded cheese from molding. Shredded cheese is usually used as a topping on pasta and pizzas. It can also be used in baking cheese scones and in cooking mac and cheese. The most common types of cheese that are shredded are cheddar, Edam, and mozzarella cheese. Grated cheese looks like powdered cheese. Grating is usually done to harder cheeses. Hard block cheese can be grated using three methods. First, a Microplane can be used. This is ideal if you are preparing small quantities of grated cheese. Simply run the cheese along the surface of the Microplane then grated cheese will fall out of the other side. Also, a box grater can be used for medium quantities of grated cheese. Like the Microplane, run the cheese along the surface of the box grater. For large quantities of grated cheese, you can use a food processor. Cut the cheese into 1 to 2-inch pieces then turn on the food processor using a regular blade. Grated cheese is usually used as a topping in pizzas, pasta or salads. Usual types of grated cheese are romano and parmesan cheese. It is best to freshly grate the cheese instead of buying pre-grated cheese to maintain the unique flavor of the hard cheese. 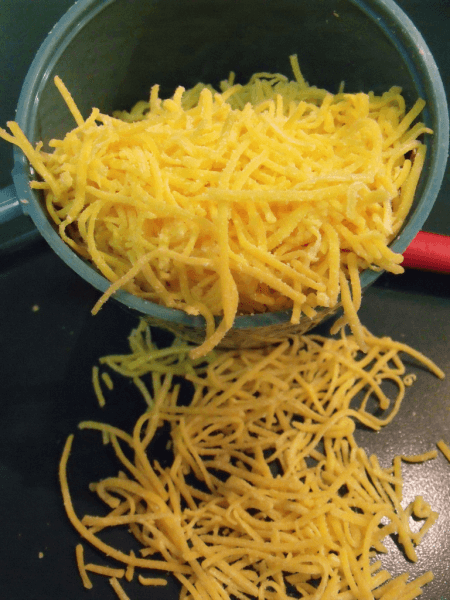 While shredded cheese and grated cheese are technically both cheese, there are still key differences on the appearance, ingredients, method of consumption, and method of preparation. Shredded cheese looks like thin strips of cheese while grated cheese looks like powdered cheese. Shredded cheese is usually made of cheddar, Edam, or mozzarella cheese. Packed shredded cheese may contain potato starch, powdered cellulose, and natamycin. On the other hand, grated cheese is usually made of parmesan or romano cheese. Grated cheese is usually used as a topping on pizzas, pasta or salads. While shredded cheese can also be used as a topping, it is also used in baking cheese scones and cooking mac and cheese. Shredded cheese requires a grater to be made while grated cheese requires a Microplane, box grater, or food processor.